HOPE Toronto may be used to serving volleyballs, but on December 8, 2012, a team of ten HOPE members was serving warm lunches to the community at Fort York Food Bank. 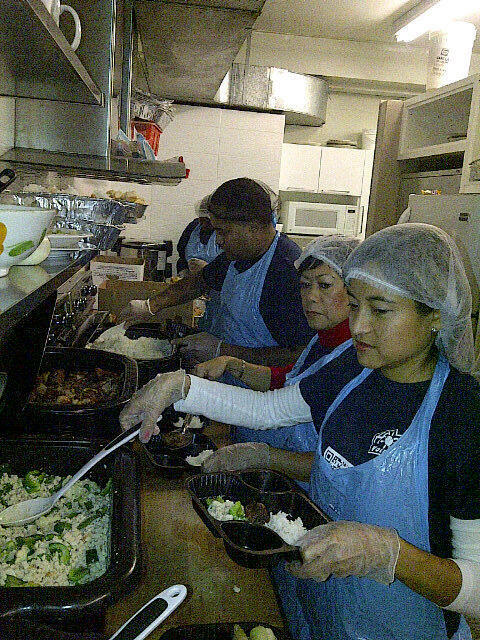 Squeezed into the narrow galley kitchen, we rolled up our sleeves, donned aprons and hair nets to relieve the regular volunteer crew who had already prepared and cooked the meal earlier in the morning. Being the foodie that I am, I appointed myself as the official quality control and taste tester! – YUMMY! The dining room was already pretty full with community patrons who soon lined the counter waiting patiently to be served their lunch while we figured out our roles. We quickly self-organized into designated stations serving drinks, salad, rice, chicken, or veggies, trying to keep the line moving efficiently. It was a great exercise for team work and a valuable team building experience! FYFB is one of our charity partners receiving funds from our fundraising events in 2012 and 2013. As a fellow volunteer driven organization, we really wanted to share in their experiences and build on the relationship beyond the funding support. I could see that FYFB really stretch their funding dollars to provide different support programs – it’s not just a food giveaway – to help community members try to break the cycle. The dedication and enthusiasm of their volunteers was amazing and you could sense the family and community feel in the room. It also gave us an opportunity to personally appreciate and connect with those who are directly impacted by the funds. But more than the monetary support, I appreciated that a community starts and is built through sharing a meal, a smile, a laugh, and a conversation with neighbours. With such a positive experience at FYFB, our HOPE family will definitely continue with more group volunteer and community building events as part of our mission of Helping Other People Everywhere. HOPE is Ready for YOU! Posted On 25th May 2014 ~ Comments Off on HOPE is Ready for YOU! CHARITY AUCTION – Leafs | Raptors | Jays | Argos – Great Father’s Day Gifts! Posted On 6th June 2013 ~ Comments Off on CHARITY AUCTION – Leafs | Raptors | Jays | Argos – Great Father’s Day Gifts! A Great Day at our 10th Annual Indoor Beach Volleyball Tournament! Winter wrap up – thank you!